It’s taken me a while to get round to writing about it, but here is my (overly long!!) 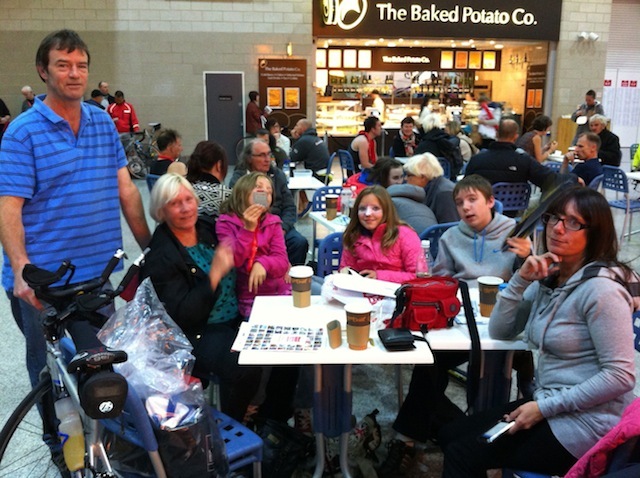 account of our weekend in London where I ran the London Triathlon. I left work a little early on Friday afternoon and headed home to pack the car. 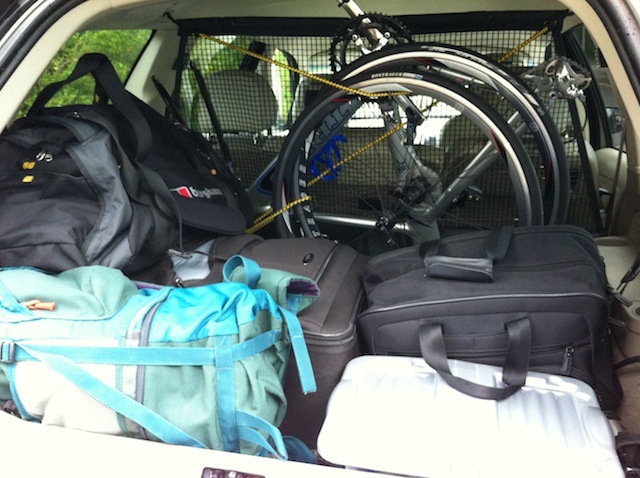 I wanted to get the bike in the car as well (rather than on a bike rack or on the roof) so that it was safe in the hotel overnight. So… How to get this.. It wasn’t too bad actually. Just take the wheels off and turn it upside down, and it fits just right! Top tip – bungee hooks are brilliant for keeping all manner of things in place! The whole family went down to London on the Friday night and we stayed at the Novotel Greenwich – courtesy of Tesco Clubcard vouchers! Two nights in a Four star hotel for £8 – bargain!!! My carb loading started in earnest late on Friday night with a visit to Pizza Express in Greenwich. The pasta wasn’t much to write home about though so I went for posh pizza, as well as some of Nikki’s and a bit of Sam’s!! Most impressively (for me), I managed to keep off the sauce! At this point, I hadn’t had a drink (beer or wine) since Sunday. Saturday was a family day into London sightseeing and to kick it off, one of the best hotel breakfasts I’ve had in many a year! 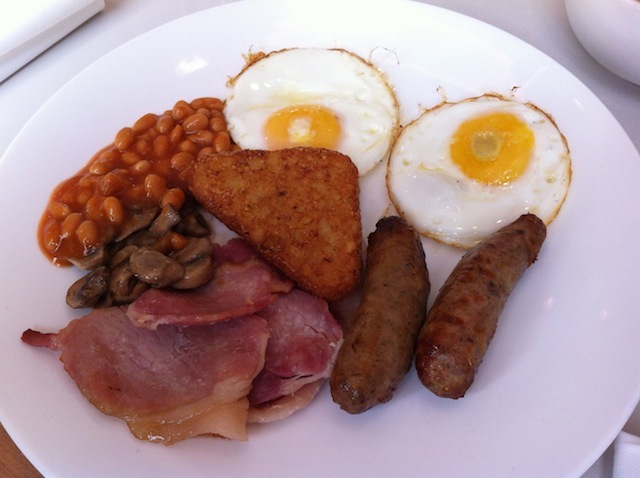 Following a first course of muesli & yoghurt, I had a Full English with the best sausages I’ve had in a hotel, and runny eggs! 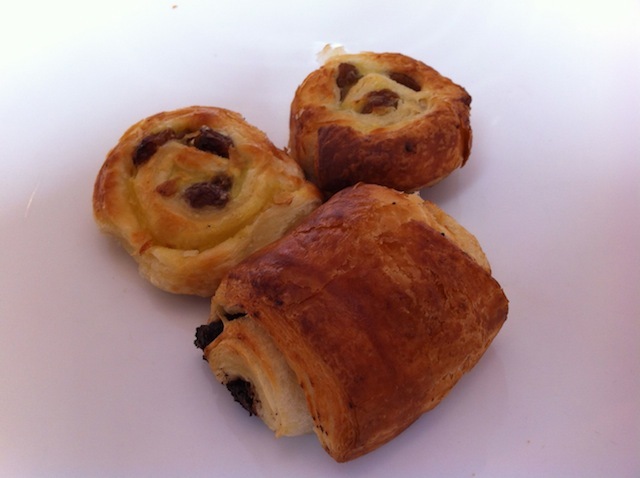 That was followed by some fresh mini pastries – obviously part of my carb loading!! Don’t they look good…? 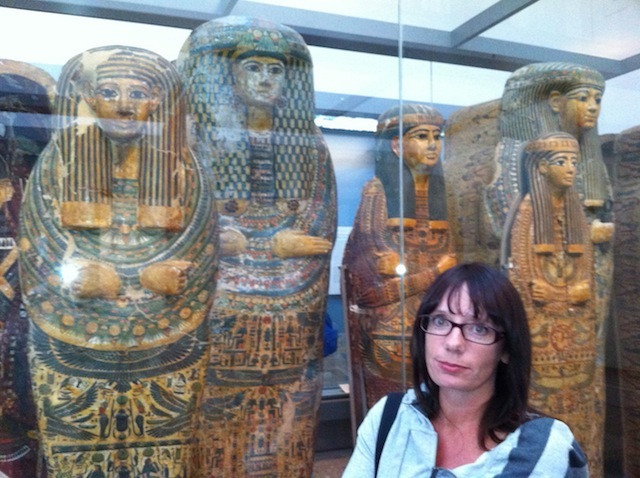 We then headed off to the British Museum, as we’d promised Lily-Anne last year that we’d take her to see the Mummies! As we got on the DLR, I got talking to someone (you can tell I’m a Yorkshireman – I talk to strangers, even when in London). He was wearing a cycling jacket for a French cycling club but it turned out he was from Germany and was in London to do the London Triathlon the following day – and the Olympic distance, just like me! What a coincidence! When I asked him what time he was hoping for he said, 2hr30′ – that’s where the similarily ended!!! I couldn’t do that in my dreams… I told him this is my first Olmpic distance and was hoping to go under 3hours! It was a beautiful day and we were meeting up with friends (Tim, Tracey, Lily & Jack) from Surrey, to spend the day in London. 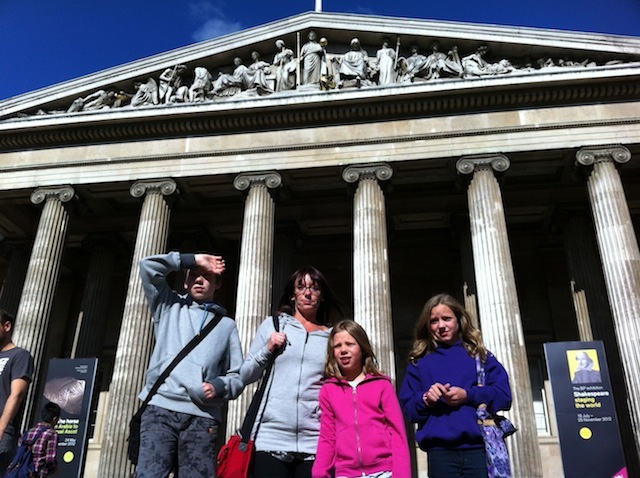 We got there a little earlier than them and had a cup of tea on the terrace in front of the Museum entrance. My thoughts kept turning to those who were doing the London Triathlon on the Saturday, whilst we were sight-seeing. They couldn’t have had better weather – calm, dry and bright. The forecast for my race tomorrow wasn’t so bright. The remnants of a hurricane system was sat over the English Channel and would be coming over London some point on Sunday. What was still unclear at this point was whether it would reach East London before I reached the finish…. 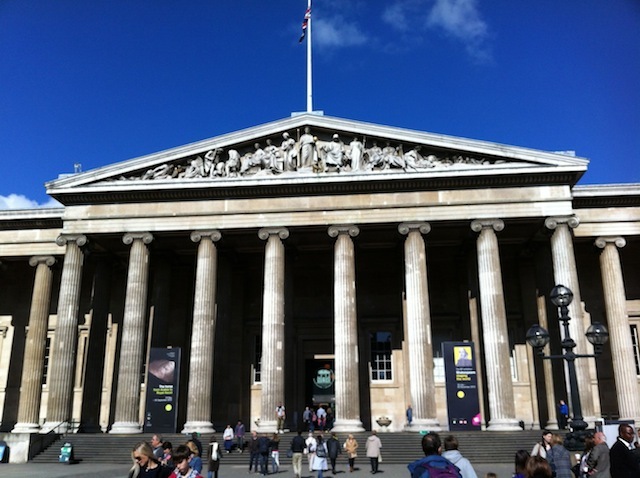 I recommend a trip to the British Museum, if only for the building itself, which is breathtaking. (I’m probably really late on this as the building was renovated inside ages ago, but its the first time we’ve been, so there!). The new central covered atrium is the most beautiful space of light and colour, with the roof that was installed for the Millenium keeping the weather out but letting the light in. We also took in the Rosetta Stone, which has a very interesting story to tell, one that I sort of knew about, but enjoyed learning of all the details whilst we were there. We then wondered off into Covent Garden in search of more entertainment. This included a trip to the Apple store (obviously), some retail therapy in the old market and watching a couple of very funny street entertainers. Dinner that evening was more carb loading (Spaghetti) in a small independent restaurant on Drury Lane. No late night allowed though, as we had an early start the next morning. Tim & Tracy headed off to see if they could get some last minute tickets for a show and we headed back to Greenwich and our hotel. I had a 7.30am race start time and the organisers wanted you there 90 minutes beforehand to check in, so that meant a 4.30am wake-up call – ouch! It wasn’t too bad for me, as I was in bed before 10pm but Nikki and the children had to get up with me – something they obviously weren’t keen on. One issue that might not be so obvious with a 4.30am start in a hotel is that they don’t do breakfast at that time of the morning (or night). They say that breakfast is the most important meal of the day, and this is even more true on race day! 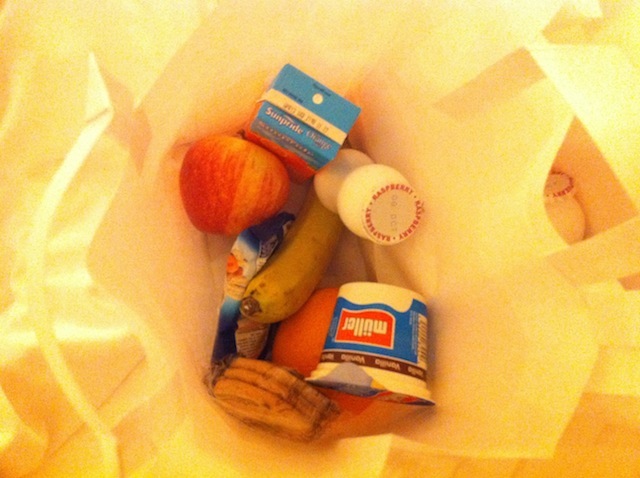 My normal pre-race breakfast would be a bowl of porridge with bananas and honey. Plenty of slow-release carbs to get me through the exertions ahead. When I asked if this was possible at reception the night before, I just got blank looks from the concierge. Well, a club sandwich and chips is all well and good after a late night out, but wasn’t really any good to me as fuel! Considering how well they’d done for breakfast on the Saturday, I had a real sinking feeling about the hotel for the Sunday morning. Getting to the race didn’t prove to be quite so smooth. We left the hotel at about 5.35am and got within a few hundred yards of the venue by about 6am, but took a wrong turning and then got caught up in all the diversions that were being set up because the roads around there were to be closed for the race itself. By the time, we’d circumnavigated the one way system again, parked the car, paid for parking and built my bike, it was 6.25am – aaaahh! Late! The Docklands Arena is quite a big place but Nikki and I had been there earlier in the year for an exhibition, so I was actually pretty familiar with the layout and got to checkin about 6.30am. I had already received all the other stuff needed (race number, bike stickers etc) through the post, so it was mainly my timing chip I was collecting, and it was one I’ve used before so that was fine. I racked the bike, clipped my shoes in (did the normal elastic band trick to hold them horizontal), put all the other stuff where it needed to be, then headed off to the toilets to get changed. Unfortunately, the nearest mens toilet block, opposite the entrance to the triathlon, had a queue coming out of it. I couldn’t believe it! I know they said this is the biggest triathlon event in the UK but its not even 7am and there will be waves of competitors starting throughout the day. I quickly walked back upstairs and headed down the long central plaza inside the arena to the next block of toilets. There wasn’t a queue coming out the door, but there was about 4 blokes waiting to use the cubicles. At this point, I have to make a confession…. I went out and into the ladies. It was empty! I quickly went into the first cubicle and started to get changed. I didn’t hear anyone come or go, until just as I came out of the cubicle, a woman came into the toilets. “Am I in the wrong place” She said. “No, no… I am” I admitted. And made my escape! All changed and ready to go, I dropped my big kit bag with Nicky and the children, and headed over to the start. My wave had just been called, and the briefing began just as I took my swim cap from one of the helpers. At this point, the compare always tries to start geeing people up with loud words of encouragement, plenty of jokes and the occasional “Oggy Oggy”. None of these things have ever bothered me one way or the other at past races. Its usual by this point for the nerves to have kicked in, and I would be thinking about getting going. This time I was suprisingly calm – I must be getting used to it! He did make a comment about the water temperature… “How cold is it..? You don’t want to know” However, when we made our way down and actually climbed into the water, it wasn’t as cold as last springs early try-outs at Rother Valley. After that, I’ve got no worries about the water being too cold! Also, after my experiences in the swim at my last Triathlon in Hatfield, I wasn’t too worried if I swim some or all of the first leg using breastroke. This was probably the main reason for the lack of nerves. As the hooter sounded and we set off, I used a mixture of crawl and breatstroke until the field thinned out enough that I could find my own rhythm. And I was pleased to find that I was able to do front crawl and breath, getting into a rhythm where I felt I could actually make good progress. The key was to breath on every stroke. In the pool, when training, I had been breathing on every third stroke. The logic of this was with an odd number of strokes you swop the side on which you breath, and this should keep me in a straight line. I was going off a odd angles last year when open water swimming. However breathing every stroke on one side meant I was getting more air, so felt better. Luckily, the swim course at the London Triathlon is a straight line out and then back with a marker down the centre to keep swimmers heading in the opposite direction apart – just like in a pool. This meant I had a guide to look at each time I breathed and didn’t have to worry too much about going off course. By the time, I got to about 1200m and turned to come back to the exit, I felt quite strong and tried to kick on a bit harder. The exit ramp had three helpers in the water up to their knees and so I was unceremoniously hauled upright, and immeadiately felt that wobbly, dizzy feeling that I always get going from horizontal to vertical. Apparently, its quite normal because the heart has got used to pumping blood around quickly in a horizontal state and to go quickly to standing and to try to go quickly straight away means a lack of blood in the head. At least, thats what I’ve read. It soon passed, but I noticed on the video a few days later, you can see me make a grab for the barriar rail and go sideways as I try to start running up the ramp and nearly miss!!! In the end the swim was 34’00” on the official time sheet – not bad at all, considering my best in the pool is 33’30” and some of this time will be climbing out and up the ramp to the transition point. I knew the tranisiton area was big and that transiton 1 would take a while and so it proved! But it wasn’t half as bad as last years ITU London Triathlon course, where the bikes are half a mile away from the swim exit. The organisers also insist on you removing your wetsuit and putting it in a bag to carry to your bike, rather than stripping to the waist and then removing the wetsuit by your bike, as normal. Perhaps this is because they aren’t allowed to get the floor wet in the main transition area!?!?! It did mean there was a few obstacles to avoid on the run from the swim exit to the bike – people removing wetsuits!! But nothing too much to worry about! The transition went smoothly but at 4’34” still seems an age compared to other triathlons, but is inevitable considering the size of this event. Comparing it afterwards to other competitiors, there aren’t too many people around my time going below 4’30” and its only once you get into the top 100 athletes that they are regularly going below 4’00”, so overall, I’m actually OK with my transtion time. Onto the bike, and into my element. This was always going to be the leg I wanted to do best at, and I went hard at it from the start. There were a lot of riders out on the course already with lots of different standards. The course is on a closed off section of London roads between the Docklands and Westminster, through some underpasses, and round roundabouts before going along the Embankment towards the Houses of Parliament, then turning back. This meant that I was often going down a decent into a tunnel and climbing back out, or over a bridge and down again, all of which slows progress when compared to just going on hard at it on the flat. It also meant, especailly around the Docklands end, there were lots of roundabouts to slow progress. I was surprised at the lack of bike handling skills of some other the riders out there. You can usually spot new competitiors as they will be on new entry level road bikes, or hybrids or even mountain bikes, all of which is fine, as I welcome anyone wanting to ride a bike! But I was surpised to see some obviously more experienced triathletes struggling with basic cornering. More than once, I was passed by a younger, fitter guy on a very expensive carbon fibre Time Trial bike, only to catch him up and pass him at the next roundabout, where I would brake less, carry more speed through the corner and then be ahead for a little while. (I don’t mean to boast – I am no good when compared to some of the other riders at the newly formed Tickhill Vélo) It’s just surprising to see the wide range of abilities. Perhaps this was inevitable at such a big event! I nearly came unstuck on the ride for another reason altogether – I didn’t read the race brief properly. I glanced through it and thought the bike leg was two loops of the same course, from the Docklands to Westminster and back. However, as I was heading back towards the Docklands at the end of the first loop, I was watching my distance build on my Garmin and coming to the realisation that I was way over half bike distance. If I turned and did the same loop again, I’d end up doing a 30+ mile bike leg, when its only supposed to be 24 miles! Something wasn’t quite right! Luckily, he was more clued up on the course than me and he knew that I was supposed to turn here. Checking after, it turned out the Olympic course was a long loop to Westminster then a shorter second loop – not two equal loops, as I had assummed. With that close escape, I finished the correct distance in 1hr8’02”. Transition 2 was 2’52” and again seemed to be pretty respectable considering the size of the venue. Very few of the top 100 athetes were under 2’30”! Out on the run and the first thing I noticed was my feet. Or blocks of wood as they should more accurately be described! Normally, if I was to go for a bike ride at 8am on a cold Sunday morning, I’d wear what are called overshoes. Plastic covers that go over your cycling shoes to keep your feet warm. If not, after a couple of hours riding on a cold morning, your feet get so cold, they go numb. Well, it wasn’t quite that cold but certainly ‘fresh’ enough that it tooke until the end of the first mile of the run for my feet to actually feel normal again. The run consisted of four short laps of the course that took you through the Arean, out past some of the office blocks then back into the arena. At the end of the first lap, I saw Nikki and the girls hanging over the barricades shouting their support, and I waved. The next two laps round I remembered where they were and headed over for ‘high fives’ as I ran past. I tried to pace myself but felt myself fading towards the end of the second lap and into the third. About half way through the race, it started to dawn on me what my overall time was going to look like. I knew that even a slow 10k would be below the hour mark, and I’d started on the run about 1hr50 ish. I was slowly realising that I could finish under my 3 hour target – well under in fact! As I came round onto the last lap, it seemed like I was going to be able to go under 2hr45′. This was all the motivation I needed so I made sure I put everything I had left (which wasn’t a lot) into the last lap. I would have hated to miss such a huge milestone by a few seconds. In the end, I did it in 2hr 42’16” – I couldn’t believe it! Considering my run was only at 8’40” min/mile pace and my swim was pedestrian, I’m really pleased with that. Overall, I was ranked 286 in my age group of 40-44 yr old men, out of the 624 who finished. This is the 46th percentile. In the race overall, I was ranked 1298 out of the 3304 men who raced. This is the 39th percentile. I don’t really hold much stead by rankings though, as I can’t do anything about anybody else’s race! The thing about triathlon is I am racing myself. I’d set myself the 3 hour goal and come well under it, surprising myself how much if I’m honest. The obvious follow up to this is whether I could get to the 2hour30 mark! The honest answer to that one – I don’t know. I’m led to believe that time is a serioulsy quick time, and I’ve never been seriously quick at anything… we shall see! A couple of days after we got home, I logged into the London Triathlon website and noticed they’d done something I’ve never seen before. They had cameras mounted all around the course, recording all the contestants. If you logged in with your number, they were able to tell from your timing chip when you went past each camera. With some fancy software, they then put together a package of video highlights specifically for each contestant. For the (sort of) reasonable fee of £16.99, you could download these videos. So I saw something I’ve never seen before. Me, running a triathlon. Not a pretty picture, I’m afraid. If you don’t watch it, I wouldn’t be surprised. But for those who want to see how it’s not done, I’ve edited it down a bit, just to shorten the pain! After returning to the main central plaza, I found Nikki and the children who by now had been met by my Mother in Law and her husband. I picked up my medal as I came through the finish line and Grace was very happy to show everyone! By pure coincidence, I looked up to see the German guy we met on the DLR, so went over for a chat (I know, I’ll talk to anyone). I asked him how he’d done and he said it didn’t go so well for him – his time was just over his target of 2hr30′. I felt a bit guilty after as I felt good about how close our times actually were! By this time, it was after 11am. As we sat around reflecting on the morning so far, we started to see other competitors coming in who had yet to start. People would be starting their own triathlons all morning and into the early afternoon. At this point, all my complaints about a really early start evaporated! I had spent the whole race competing in near perfect (if a little cold) conditions. Looking at the people coming into the central plaza area as they arrived, it was apparent that the conditions outside had changed, considerably! The remnants of that hurricane had arrived, with a vengence! Everybody was absolutely soaked – and that was before they had started. Outside apparently the wind had come up and it was absolutely pouring down!. We wondered out to get some lunch about midday and saw first hand how bad the rain was. I felt really bad for anyone who’s start time was any time after about 10am – they faced terrible conditions on the bike ride! It got progressively worse through the afternoon and I learnt the following morning that the last two waves got cancelled and the competitiors had to just do the ride and run – the wind was getting up so strong that it was whipping out the water in the dock and making it too dangerous to swim in! So I was really lucky to get such good conditions! The reason I do these daft challenges is two fold. Of course I want to stay fit and stretch myself, so having a goal like the London Triathlon is brilliant! Much more importantly though, it is to raise funds to find a cure for Samuel. The Juvenile Diabetes Research Foundation (JDRF) are funding most of the research required to find a cure for Type 1 Diabetes, and this is Sam’s best hope for a normal life without hypo’s and carb counting, for a normal nights sleep, for not having to always be connected to an insulin pump and a continuous glucose monitoring etc etc. Having returned from the race, our attentions turned to the fundraising required for our main goal. We had a fundraiser at the Millstone in Tickhill featuring the band Saint Harlot, much more of which in another post. Thanks to everyone’s support before and after the gig, we managed to raise a total of £1,791.04 which has now gone off to the JDRF. 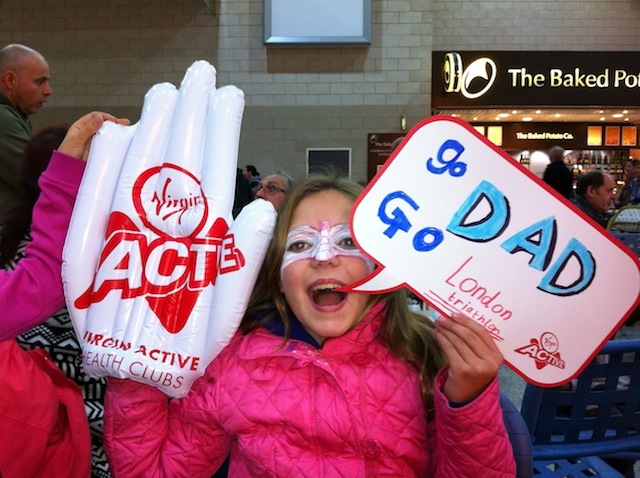 4 Responses to London Triathlon – DONE! Great post Gareth and well done. I was getting fed up of keep reading “Time to taper and think of my goal” Sounds like you all had a good weekend. Brought back a few memories Novotel and Pizza Express Greenwich. You guys seem to have a good set up down there in Tickhill, must me nice to have regular training partners. I have one friend I ride with but he only does Sundays in the summer at 7.30am thats it. I need to look out for others in the area. Also enjoyed the video. I need to get back on track with the blog. Where does the time go!!! Have you thought about seeking out your local cycling club? We’ve just got one starting up in our village and it covers all abilities and ages – very sociable! 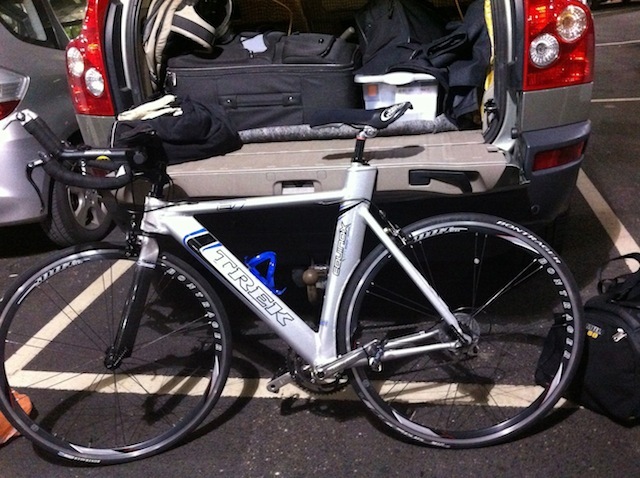 Epic – and I’m talking about the blog, not the Tri itself. Well written, great details. Glad that you beat your time by nearly 18 mins. 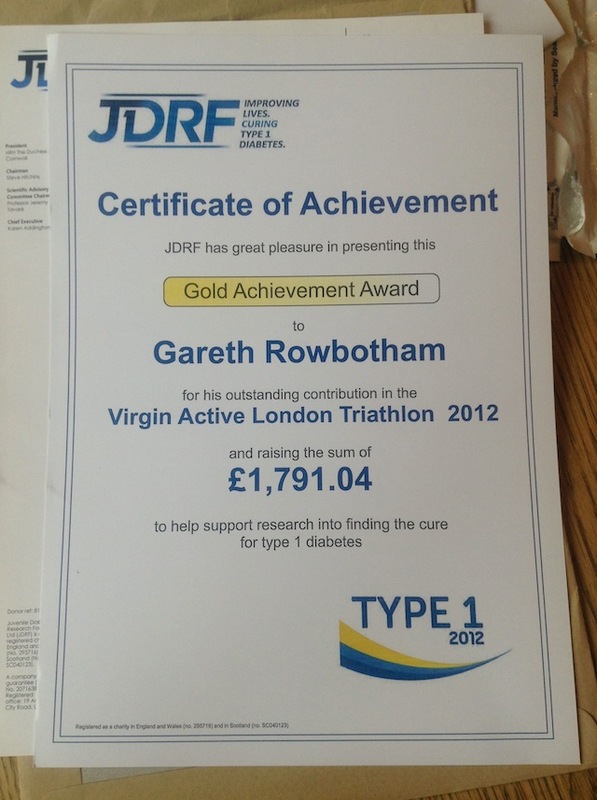 You, your family and JDRF should be proud. Onwards and upwards, 2:30, no – go for 2:15 the next time. All the best for the future events. Cheers for that. I dont know about 2:15… I’d be turning pro at that level! !